“Hey guys, have you heard of this new thing called Magic?” Right after I said this, I knew I would get a few people saying, “Wow Mark, did you really just say that?” But I wasn’t talking about the Abra Kadabra stuff we saw at birthday parties as a kid – with that magic I could usually find the secret to the trick. Imagine a type of magic where you are able to text a random number for anything in the world. Then, you receive an estimate as to where and when it will arrive with a price quote. Magic will charge your credit card and then you wait for your order to arrive. Welcome to the magic of Magic. Magic acts as your “go-to-guy” for anything you need at the tip of your fingers (as long as it’s legal). The examples below show a boyfriend forgetting to get his girlfriend flowers for their anniversary (I promise you this is not a screenshot from my own phone) or a hungry student ordering a large pepperoni pizza and a Diet Coke (no promise that is not me). The Magic operators respond with a confirmation, a price estimate, and a request as to whether or not the user accepts the agreement. Once the user accepts, the credit card is charged (after the operators collect it through a 128-bit encrypted HTTPS link) and the operators place the order. This doesn’t differ much from a normal order process for a service, except for the fact that the user can complete the whole process via text. So what is it that makes Magic unique, and who is it trying to reach? To start, Magic claims that it can send you anything as long as it is legal to buy or sell. Seems like a pretty hefty promise, especially for users that may be extremely remote. Can I send them an order for In-N-Out all the way from Boston? That certainly may be legal. However, the surcharge on the fee might cost me a pretty penny. According to Business Insider, the operator has the final discretion as to how to place the order, and he or she can either order the item directly online and email it to them (like with plane tickets) or go through another third-party website like Instacart or Seamless. Still, in addition to paying the surcharge associated with the third-party service, Magic also decides to take a cut and add a tip on top of that (hey – with a free texting application that can’t rely on advertisement, they have to make money somehow). When I first heard out about Magic, I thought there was no way it would catch any sort of traction. What is the draw to texting a number when you can use that same iPhone to go on Seamless or GrubHub and order some food right to your door? Clearly (as with many of my social media assumptions), I was wrong, for Magic received 17,000 text messages in the first 48 hours since launch. Part of it is the crazy promise from the service. When co-founder Mike Chen says that he can deliver anything, he is standing behind the promise. According to TechCrunch, requests in the first two days ranged from sushi on a boat to a tiger delivered to someone’s front door (couldn’t help but make my remember this iconic scene). While there is no confirmation as to whether or not the fury beast was actually delivered or how much that request would cost, the sushi was delivered to the boat, even though Magic they had to scramble to find a way to complete the transaction without the help of a third-part intermediary. Still, they stuck behind their promise, even if it meant sending the co-founder or one of the operators to complete the purchase. Another draw to the service is the mystery behind it. The company reported text messages from users asking whether or not they are talking to an actual person. Some of them ask if they really can order anything, and they may even be lucky to receive a clever joke back from one of the operators. As we have seen from different social media tactics in this course, the customer enjoys a service or company that has a human on the other end of their tweet, text, or post, especially if that service comes with witty, helpful, and personalized operators. Those interested in the service might test it out to see what it’s all about, and eventually realize the value in transmitting your order through an actual person rather than an online system. 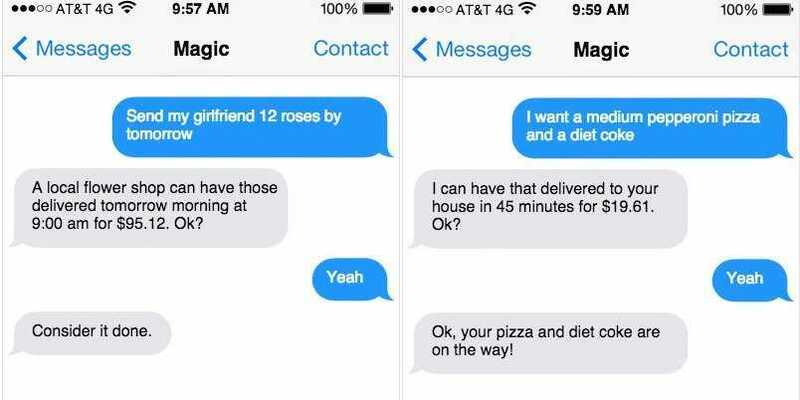 To me, Magic seems to be the friend, parent, or assistant that you need to text in a pinch in order to get a favor. Sure, they will charge you, but their ultimate goal is to facilitate your transaction with ease and make sure that they leave no questions unasked (i.e. whether or not you care if the flight is direct or if you just want the cheapest option). I may be tempted to send in my request for a nice Double-Double Animal Style order from In-N-Out delivered to Boston. The price may be one thing, but the way that they get it to Boston? That, my friend, is where the magic lies. Great post! I’ve never heard of this service before and while it seems a bit extreme, I can’t say that I am completely surprised that it exists. The internet and social media have definitely made our lives easier and services are much more convenient. Information about everything imaginable is at our fingertips and when we can’t make it out to get food, we can have it brought to our doorstep. Although these aspects of social media can be very useful, services like Magic seem to not only aim to make our lives easier, but also capitalize on our laziness. People are always a few feet from our phones or the internet, and companies know that. By creating these services, it seems as if they are just tempting people to stay inside and use their services even if they could pick up the item themselves. Consumers have grown so accustomed to having this convenient service, it seems as though the extra fee doesn’t even faze people. We have definitely become spoiled in what we expect to be done for us as a result of services like Magic. Mark, this is so cool! Like Michelle, I have never heard of Magic before, but I do find it very interesting. I believe its greatest attribute is the mystery behind it. One thing that surprises me is how individuals who use Magic immediately trust it to, say send flowers to their loved one. After all, they are providing a complete stranger with sensitive information such as addresses, names, and phone numbers. Though someone may counter argue this with Uber, as an example, the service does provide riders with the driver’s name, number, and car model incase something does happen to go wrong. Also, riders can ensure they are being charged a fair price with Uber and are warned before hand if there is a surge charge. With Magic, however, how can someone know they are being given a fair price or not? Another point that sparked my interest was how many people Magic must hire to keep up with such a large load of texts that need to be responded to case by case. I am also curious to know the average wait time it takes to get a response from Magic. All in all, this is a great post and it really grabbed my attention! I will definitely look into Magic and try it out myself to see how it works. Good job, Mark! This is a really cool post. Just like Cristy and Michelle, I’d never heard of Magic before. It’s an interesting concept, especially when you point out that it’s already pretty easy for people to order things online through apps or websites, and that using Magic adds some extra costs. Also, Cristy makes a great argument–there’s a lot of trust involved in providing sensitive information, in a way that other services do not require. However, the concept of texting a real person probably adds some appeal–it’s not just a machine. I’m interested to see how the company grows and keeps up with these demands–I’d think they’d have to specialize into some niche at some point, rather than just promising everything. Because I was interested in learning more about this company, I stumbled on this article from Wired about how he tried to ‘stump’ the site–there’s some pretty neat stories, like the one where Magic employees went to a store for the customer, tried on a sweatshirt for him, sent a selfie of the sweatshirt and even got him a 20% discount on the item. There’s definitely value in that, and there seem to be no limits–Magic got the guy a box of condoms one night, and, since it’s medically legal in California, connected the user with a medical marijuana dispensary that delivers. Here’s the link: http://www.wired.com/2015/03/stump-magic/. All in all, I’m definitely going to keep an eye on this company! I really enjoyed reading your post! Like all of the classmates who responded to your post, I never heard about this delivery service before. I think it’s a very convenient and cool idea, as you can get delivered ANYTHING (as long as it’s legal). It’s comfortable, that you don’t have to find a certain page or juggle the apps where to order your desire. It’s astonishing that they manage any middlemen involved in the process to fulfill an order and that you don’t have to care about anything. I also love that you can send off a text message and a real human answers and asks for further details. I watched the video posted in the comments and was really surprised good the service worked. I’m definitely going to try it out. Just like everyone else who commented, I have never heard of Magic! (You are probably tired of reading that comment by now.) But this service sounds too good to be true! Magic seems so easy to use, and especially for people like me who can get lazy, it is a dream come true. The only issue I have, mentioned in another comment above, is whether or not the customer is getting the best deal. If Magic could guarantee getting the best deals before adding the tips on top, then it would be a home run company for me! One question that immediately popped into my head was how does the company choose who to hire? If there are people actually going to stores and getting things for the customers like another comment mentioned, does this mean that none of the texts are outsourced to other countries? Does a different person respond to you each time? How much are the employees getting paid? I might just have to go try this out the next time I want to order something! Thanks for sharing the Magic with everyone! I feel obligated to continue the trend by noting that I have (also) never heard of Magic until this post. The concept of it is very obvious, considering with smartphones users are very dependent on instant gratification, but it was a bold move by Chen to actually implement this idea. I think this service is definitely more of a novelty than something you can depend on. As you mentioned there are tons of draw backs to Magic: high prices, shadiness with operators, lack of control. But you were right as well that what makes Magic so enticing is the human interaction side of it. I skimmed the article Erin posted and thought it was hysterical that one of the operators went to the extent of going to a store and trying on a jacket for the author. It’s those kinds of interactions that make the service worthwhile. Since you can pretty much order anything you like from your phone to be delivered (GrubHub, GoPuff, Amazon), Magic doesn’t seem to offer anything different enough to compensate for the high markup, except for this human interaction part of it. Knowing that someone is on the other side of the transaction personally making sure you receive what you request is very intriguing. I definitely agree with Erin’s comment that this service is more of a novelty than anything else, and I think that this helps Magic tremendously. Still, I wonder if Magic will be able to remain just texting service, and not feel the temptation to create a mobile application that enables texting, as well as other unique features. Basically what I’m asking is: how essential is the texting service to Magic’s success? The ability to order ‘anything you want’ is a little overwhelming (as Erin’s article showed), and maybe an application could offer recommendations, or the ‘most popular orders’ in the area/city to get ideas flowing. Anyways, I can’t wait to use Magic, and I’ll definitely let you know how it goes when I get my first purchase. The novelty aspect of Magic reminds me of the Yo app when it launched. Yo was basically useless in it’s first form, but as we heard about during a class presentation, they were able to pivot once they had gained people’s attention and build an app that was actually useful. I think that many of the people using Magic now are doing it just for the novelty of having used such a mysterious service, but I can definitely see the operator taking the service in a different direction in the future. I like this post a lot. Magic is a great idea, but it seems like it would be very hard to keep up with and be accountable for all the orders placed on magic. I think that it is pretty funny that they have to have a disclaimer that they only can provide goods/services that are legally bought and sold. I would think that this would be implied, but I can see some of their clients requesting illegal materials. I will be interested to see how Magic grows and if it continues to gain a following, and when it does how it will deal with the traffic. I have heard of other services like this but that specialize in dorm room delivery at all times of the night. I would like to know how fierce the competition is for services like this. Great post. Likely too open ended to be successful for the long run, but they may be able to mine the data and optimize on the most common requests. I had actually read about this from a friend of mine that posted it a couple of months ago. The fact that Harvard kids were able to come up with this service that runs all over the city picking up products is awesome to me. I can’t imagine how they could expand this beyond what it already is, or how they will differentiate themselves from other apps that are very similar. Great post, thanks for sharing!